Repointing Masonry Structures - The WAYNE GROUP INC.
Repointing is the removal of deteriorated mortar from the joints between masonry stones or bricks and the installation of new mortar into those joints. Most exterior masonry will need to be re-pointed eventually. The re-pointing process will reduce the weathering effects and will help reduce the amount of water that will penetrate the masonry. It will increase the longevity of the mason structure and prevent deterioration due to the infiltration of water into the masonry. Typically, re-pointing will last twenty to thirty years. Any repointing must be performed properly or the repointing will do little to extend the life of the structure and in some cases may lead to irreversible damage to the structure. Proper repointing will protect historic masonry structures, however, it is important that a master mason trained in the art of repointing inspect the structure and determine which joints to repoint, and determine the correct mortar for each specific job. Inspection and repointing should only be performed by an experienced trained professional to ensure the longevitiy of the structure. 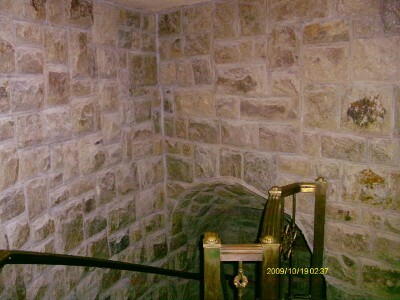 Mortar has been used for masonry projects for thousands of years. Today’s common mortars are a combination of sand lime cement mortars. Choosing and using the correct mortar is important and many structures today have specific specifications to ensure the structural integrity of each build. The difference in mortar types is achieved by varying the proportions of cement, lime, and sand. In some projects, pigments are added to match existing mortars. Most historic buildings use no cement at all. Just a combination of lime and sand. Mortar must have some softness or flexibility to allow for movement while also maintaining a bond with each adjacent stone or brick. It is a common misconception that strong mortar is better. This is simply not true. The mortar must be softer than the adjacent masonry materials to prevent damaging the stones or bricks. If the mortar is too strong, it can form stress cracks and eventually deteriorate the masonry structure. The removal of the old mortar is important and removing the right amount in a uniformed manor will ensure a proper repointing process. The mortar can be removed using various tools such as grinders, chisels, hammers and other hand tools. It is important that the removal of the old mortar be performed carefully by an experienced mason to ensure the stones or bricks are not damaged in any way which could compromise the masonry structure. Once the old mortar, debris, and dust is remove, the repointing procedure can begin. The new mortar will be added in a controlled manor according to specific specifications to prevent shrinkage and overall uniformed look. Once the repointing procedure is completed, it will be thoroughly inspected. If the project is completed properly, the masonry walls will be aesthetically pleasing to the eye and long lasting results will be achieved.